Tonight at Pancho’s John Forbes and I will joined by Velcro & Spoony from Velcro Lewis, Alan Scalpone of The Bitter Tears, and rumor has it Electrical Audio’s Greg Norman. It’s Tijuana Hercules and it’s free! I just finished writing about the Tijuana Hercules tour of Georgia and Florida. Read about it on my new blog Drumber. A couple of weeks ago I had the fortune of hosting three nights of stand-up comedy at The Hideout in Chicago. Headliners included Hannibal Buress (SNL, 30 Rock), Todd Barry (Letterman, The Wrestler) and Wyatt Cenac (The Daily Show). Hometown heroes featured were Cameron Esposito, Dan Telfer, and the enigma that is Gabriel Wallace. Very little is known about Gabriel. He does comedy, but isn’t a fixture of the local stand-up or improv scenes. Perhaps you’ve seen him at The Pitchfork Festival, introducing bands without a wristband to the frustration of the festival organizers. When asked if he had a website, Gabriel replied, “Amazon.com”. There are no images of Gabriel online, so I drew one. 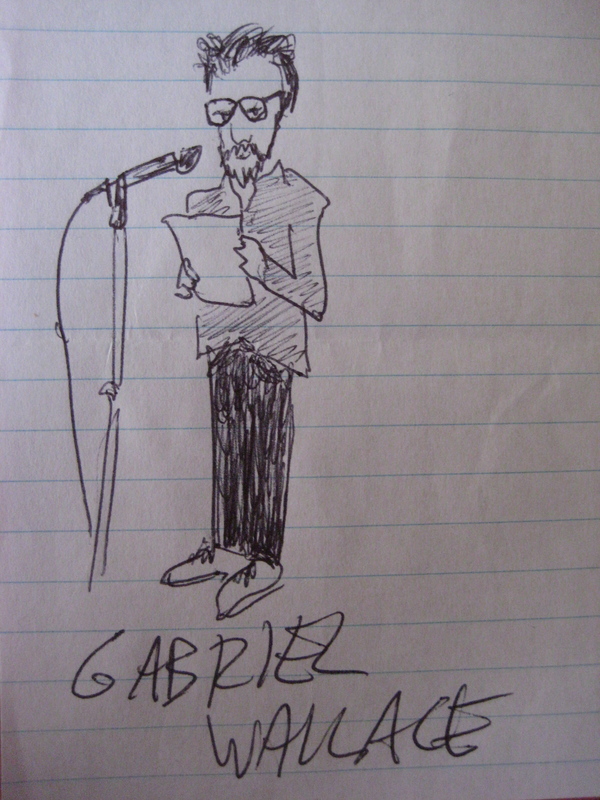 Tonight Gabriel opens for Cass McCombs at Lincoln Hall. Between 1994-1997 I worked as a disc jockey for 93.7 KCLB in Palm Springs, California. It was a small market AOR station operating out of a remote carrot patch in tiny (pre-Coachella Fest) Coachella. I went by the moniker Tony Montana. As a radio personality, I was given carte blanche, and mostly stuck to derivative, second hand Letterman bits with Jon Spencer interjections. My style could be classified as undisciplined smart assery. In 1996, I compiled an aircheck tape that I sent out to alternative stations in larger markets in hopes of breaking out of the miserable, soul-searing desert. I attempted to show the big boys that I could ramp a song, backsell, read copy, use listener requests, and be funny. A big thanks to Aaron Burruss, an avid KCLB listener who had become my friend and desert landlord. 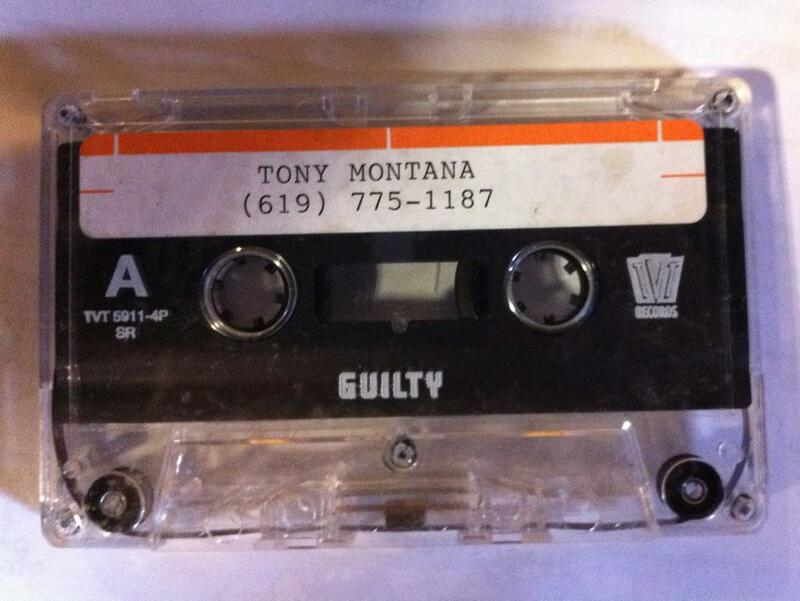 Aaron recently unearthed this cassette in a box of other old junk. It’s 2012 so I decided to devote a website to myself. Eventually you’ll be able to read things I wrote, hear music I made, and see drawings I drew. And then we can all do something else.